Taylor Dawson goes up for a kill for Miami Trace during a Frontier Athletic Conference match against Jackson in the Panther Pit at Miami Trace High School Thursday, Sept. 13, 2018. 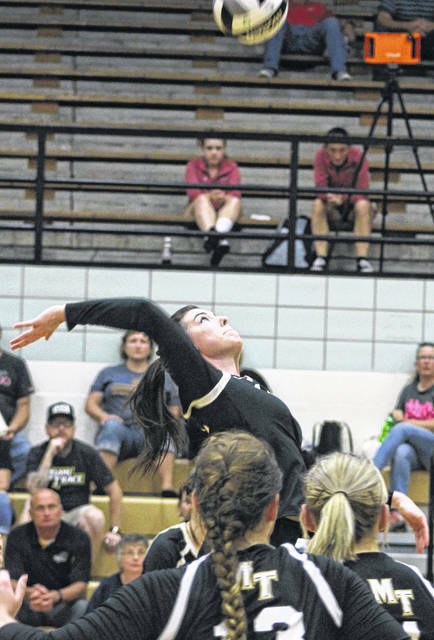 Unless there are changes to the schedule or the Lady Panthers get a home game in the tournament, the Miami Trace volleyball team played its second-to-last-ever match in the Panther Pit when they hosted Jackson for a Frontier Athletic Conference match Thursday, Sept. 13. The scores might have gone even higher, but the match could not have been closer. However, it was just two points in every set that ended up separating Jackson from Miami Trace. In the end, the Iron Ladies came away with a grueling five-set win over the Lady Panthers. Scores of the sets were: 23-25, 23-25, 28-26, 26-24 and 13-15. “It was a heart-breaker to lose,” Miami Trace head coach Doug Mace said. “That was probably the best we have played this season. We were playing tough and Jackson was, too. It was evenly-matched. Both teams were playing well. Statistically for Miami Trace, kills: Olivia Fliehman, 13; Ashley Campbell, 12; Laura Robinson, 9; Taylor Dawson, 8; Delaney Eakins, 8. Kate Leach had five ace serves. Miami Trace is at Unioto Saturday for an invitational. The Lady Panthers are at Washington High School to complete the first round of FAC play Tuesday with the j-v match beginning at 5 p.m.